Five Andover seniors (L to R: Nelson Makechnie 8, DJ Rankins Goalie, Ryan Methven 3, Myles Powers 9, Jack Newton 5) contributed to Proctor Academy’s varsity soccer team securing its best record in over 25 years at 11-4. The fall trimester at Proctor saw local students thrive on the athletic fields for the Hornets. With thirty-four Andover residents enrolled at Proctor, 17 of these students competed at the varsity level during the fall season. 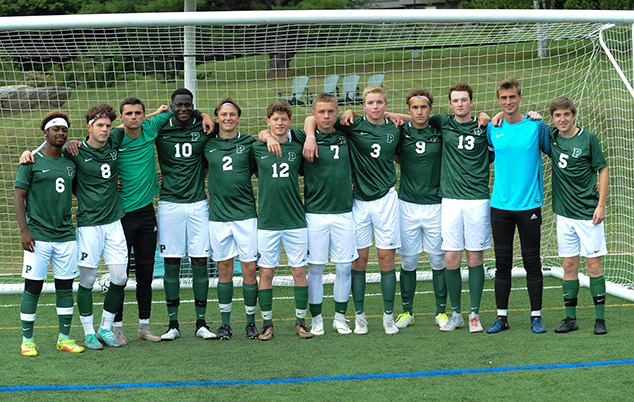 Proctor’s boys’ varsity soccer team remained a bastion of local talent with 11 of its 19 members as day students, including five former Andover Eagles (Ryan Methven ‘19, Jack Newton ‘19, DJ Rankins ‘19, Myles Powers ‘19, and Nelson Makechnie ‘19). The team narrowly missed a bid to the New England tournament finishing at 11-4, the team’s best record in over 25 years. Proctor’s girls’ varsity soccer team also featured a number of Andover students as Brynne Makechnie ‘22, Sasha Mackenzie ‘22, and Lily Manard ‘22 joined James Southworth ‘21, Vienna Marcus ‘20, and Hailey Makechnie ‘19 (captain) on the field this fall as the girls’ posted an impressive 9-6-1 record. Julian King ‘19 and Ezra Jenifer ‘19 helped anchor a small-in-numbers, but big-in-heart varsity football team (4-4 record), while Katie Bent ‘21 and Chloe Makechnie ‘20 were stalwarts on the varsity field hockey team, and Matt Bent ‘19 (cross country), Sean Slick ‘20 (cross country), and River Turnbull ‘22 (crew) also played vital roles on their respective teams. Be sure to check out Proctor’s Athletics website: www.proctoracademy.org/athletics for a complete list of Fall Award winners. Updated winter game schedules for hockey, basketball, and skiing are also available online. All games are open to the public and we hope Andover residents take advantage of the top notch hockey, basketball, and snow sport events on campus this winter.